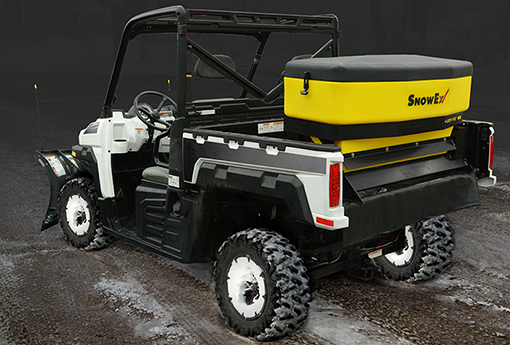 The new SnowEx® Drop Pro™ drop spreader (SD-600-1) features an all new, user friendly and intuitive variable-speed digital control that offers flexible mounting options. With a 6-cubic-foot material capacity and a 36-inch spread width, the new SnowEx® drop spreader offers controlled application of bagged ice melters and bulk rock salt, making it the ultimate sidewalk spreading solution. The enhanced digital control allows for precise material flow adjustment. Features a compact design for simplified installation, bright LED lights for better visibility, self-diagnostic digital display for troubleshooting from the cab and integrated buttons for plug-and-play accessory control. Features a unique, 36-inch-wide drop material distribution for maximum spreading precision, especially when maintaining sidewalks and other narrow areas. It’s a gateless system designed not to leak any material between applications, contributing to saving time, minimizing material usage and reducing turf damage. To help prevent corrosion and maximize service life, the drive system is sealed for protection against the elements. The vibrating baffle allows a consistent flow of materials to the material feed system. Keep large clumps of salt out of the hopper with the standard top screen.